Stay perfectly groomed with the Wahl Action Pro Clipper, a rechargeable hair clipper with complimentary ear and nose trimmer. Designed to expertly cut hair, the cordless device allows for flexible movement when cutting, and comes with rinseable blades for a fresh, hygienic trim each time. The trimmer lasts up to 60 minutes when fully charged, but can also be used with a cord if power starts to run low. The powerful tool professionally cuts hair into shape and the additional nose and ear trimmer ensures you looked perfectly groomed all-over. Fitted with an intelligent LED display light for charging visibilty. Clipper, 8 guides combs, storage case, scissors, barber comb, oil and cleaning brush. Complete with a wahl styling guide. 12 hour charge time for 45 minutes usage. 12 attachments included: comb attachments no.1-8, comb attachments no.0.5 and 1.5, left and right ear taper. 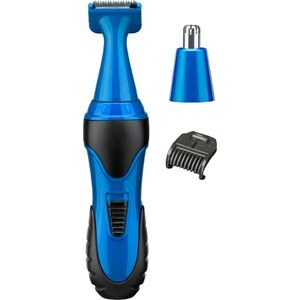 BaByliss For Men Mini Trimmer - Blue.